Solar power plant needs to be placed at the roof of house, where you live. Number of solar panels should be sufficient to produce as much electricity over the year, as your household spends it. Your house is still connected to power grid and over the day you are filling into and over the night, you are taking from the power grid. If you produce less (in one calendar year time) as you spent, then you have to pay the difference and if you produce more, you simply give it to them. In our case this meant, that we will build 8.1 kW power plant with 27 solar panels (300 W each), but have decided to take 15 kW AC/DC converter. Stronger converter is needed for the future, if our household power consumption increases. Since I like to understand, how things are working, I dug my self into available documentation and was watching closely each step of installation. I also took care my self for all pre-requirements and digging for laying cables. After all bureaucracy slowdowns and consequent pushing, we got allowance to start with production on 4th of December. Since December is the month with shortest days, first month contributed only 224 kWh. But first full year has just started and I will see in one year time if our production is sufficient or not. Since I can remember, we were catching rainwater. I even asked my grandmother once, if she knows when stone and concrete tank was built. She told me, that it was there long time before she moved here somewhere in fifties of last century. Already at that time no person alive knew that. When we were building our own house, we already installed all necessary to catch and consume rainwater. We use it for car washing, watering garden, working, as toilet water and other outside purposes. After few years of use, water tank started to leak. I repaired it twice, but unfortunately it was holding only for couple of years. So it was time to replace it. Luckily, there is company Aplast very near to my home, and I could fetch plastic water tank myself. 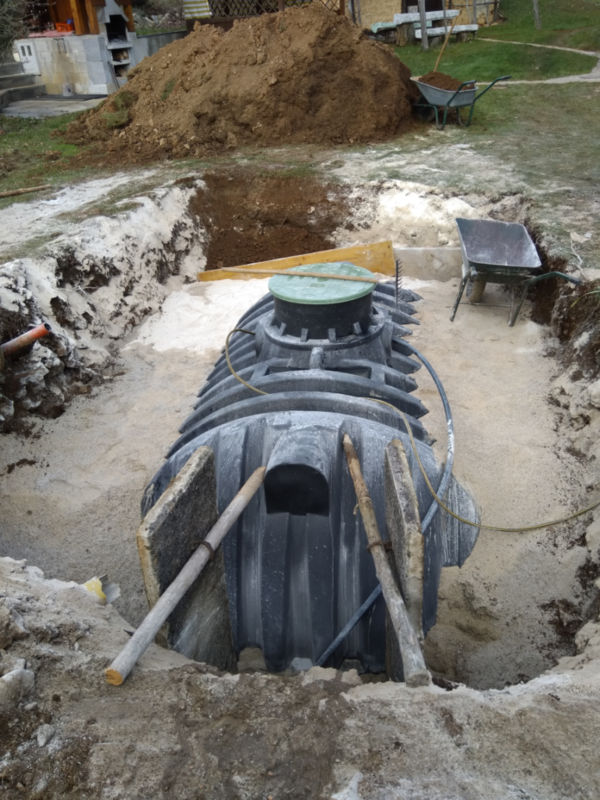 We decided to buy 12.000 liter tank, since similar volume also the old one had. After 2 months of waiting for excavator, we finally started with digging. Digging actually took just one full day, but the rest of the process was manual and took a bit longer. At this point in time, I have about 2 more days of work, but I have to wait for warmer weather. Concrete does not loke to be made, when it is bellow freezing. However, it is all ready and I am good to continue in next days. I was not only physically active in this half year time. 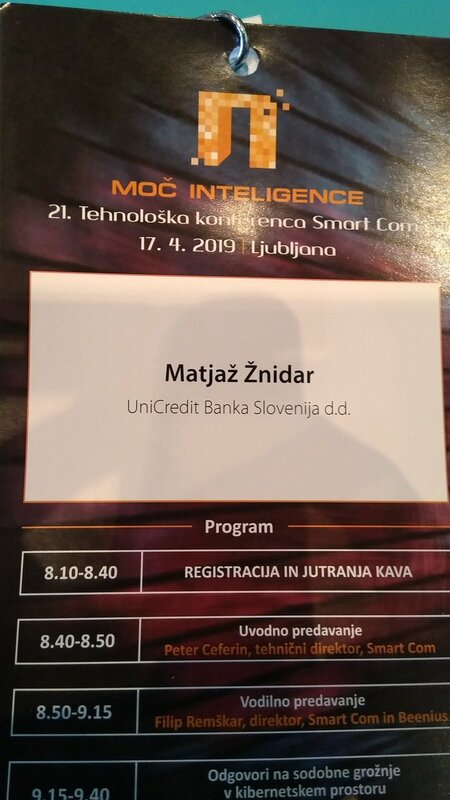 After many IT-related presentations in Slovene, it was time to present in English again. So I had opportunity to present at one of my favorite conferences (E2EVC), which was in Athens (capital of Greece) this time. My presentation with title “Go and make this IT more secure” reflects a lot of security work, I am focusing on in last year and a half. This was also the first time, that recording of my presentation is available on YouTube. I must confess, that this was very nice experience and it is well worth repeating it. Additionally also my employer liked the presentation and I repeated it several times also in Slovene for my coworkers. Since we all need to expand our knowledge, I also visited some workshops and conferences. In addition to E2EVC, where I was also presenting, I also visited InfoSEK 2018, “Pogled v prihodnost kibernetske varnosti” (by A1 and Finance), several SloWUG and other after work community meetings and Capture the flag workshop (by SmartCOM). Despite being lazy at writing blogs, I was very active all the time. I broadened my horizon, learned a ton of new stuff, did a lot around our house and also vacationed a little bit. Previous Previous post: E2EVC is what I was looking for! Next Next post: How secure is secure enough?